Middlesbrough boss Aitor Karanka has confirmed Chelsea youngster Kenneth Omeruo is poised to join on loan. The highly-rated Nigerian international central defender will sign a loan deal until the end of the season and join the squad in training tomorrow. After witnessing a meek exit from the FA Cup with a 2-0 third round home defeat to a weakened side from virus-avaged Hull, the Spanish boss knows his team needs strengthening in all departments this month if it is to build on its Christmas revival in the Championship. Kenneth Omeruo, 20, signed for Chelsea from Belgian top-flight side then was loaned out to Dutch first division outfit Den Haag and was among Nigeria’s stars as he played every game on the way to winning the African Cup of Nations last year so comes with a pedigree. Karanka, who was Chelsea boss Jose Mourinho’s assistant at Real Madrid, said: “He is a good young defender and I’m happy because he comes here to help us and add more things to the players we have now. “He’s a player I know well. Jose has told me all about him,. Boro have been linked with a host of other Chelsea players including midfielder Nathaniel Chalobah, whose three-month loan at Nottingham Forest finishes next week. However, Karanka laughed off some of the more high-profile names thrown up by the rumour mill. The boss admitted his side fell well short of their recent high standards as they were comfortably brushed aside by Hull despite Steve Bruce’s side being forced to make nine changes after a sickness bug ripped through the squad. The Teessiders lacked intensity and discipline, were sloppy in possession, creaky at the back and lacked teeth. Hull in contrast were far from exciting but were efficient and organised and made their two real chances count. 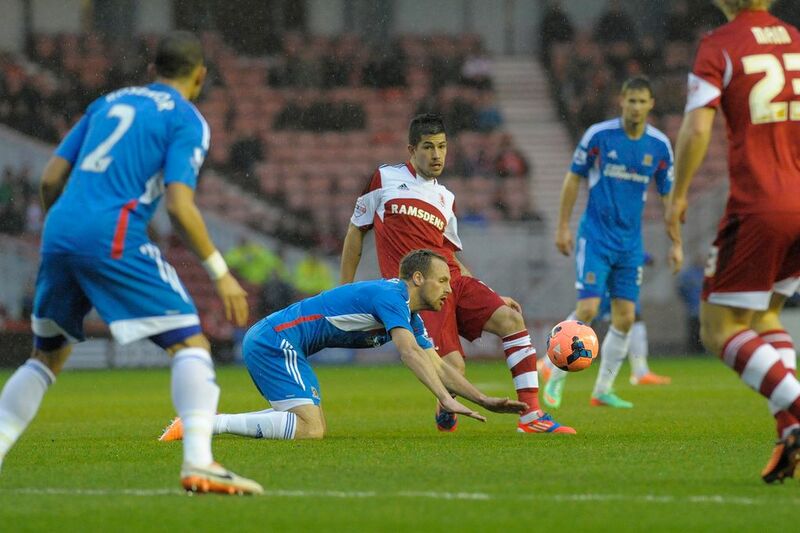 The visitors took the lead on 10 minutes after a slip-up by Boro and a lucky bounce in the box. Boro winger Emmanuel Ledesma was robbed by former Sunderland man David Meyler who cut inside and drilled in a low shot which hit defender George Friend and rebounded kindly for Aaron McLean to stab home over the advancing keeper Dimi Konstantopoulos. The game quickly became bogged down in midfield with lack-lustre Boro struggling to get any passing rhythm going or penetrate into the Hull final third in the opening half. They perked up after the break and Friend fired wide then after a good move on 58 minutes former Sunderland midfielder Dean Whitehead blazed over from 20 yards. However, Hull scored a killer second goal on 61 minutes as Paul McShane found George Boyd in the box and he tricked past his marker and then cut the ball back for unmarked Nick Proschwitz to slam into the roof from 10 yards. In stoppage time Boro had a final flurry but first Curtis Main headed into the side-netting then at the death Leadbitter had a shot tipped over but it was too little, too late. Karanka admitted it was a missed opportunity but pointed the finger at his own side’s lack of urgency and the effects of five strength-sapping in two weeks. He added: “We had a very good chance to win the game because Hull made a lot of changes from their first 11. “They were just much better than us. MIDDLESBROUGH: Konstantopoulos, Varga, Gibson, Rhys Williams Friend, Leadbitter, Whitehead, Ledesma (Adomah 46) Emnes (Butterfield 83), Luke Williams (Jutkiewicz 46), Main. Subs (not used): Richardson, Hines, Ripley, Smallwood. HULL: Harper, Rosenior, McShane (Chester 76), Faye, Figueroa, Boyd Quinn (Jahraldo-Martin 83), Meyler, Gedo, Mclean (Elmohamady 80) Proschwitz. Subs (not used): Jakupovic, Sagbo, Fletcher, Fryatt. Goals: Mclean 10, Proschwitz 61. Attendance: 15, 571 Referee: Kevin Friend (Leicestershire).